In a video earlier this month, AppleInsider compared Apple's 2018 iPad to the 2017 10.5" iPad Pro to help people decide if the new budget iPad is good enough for their needs, or if they should opt for an iPad Pro instead. Battery life was omitted from the video due to the amount of time required, as it takes multiple consecutive workdays to run all the tests. 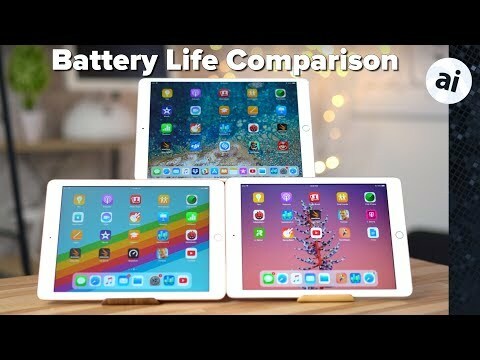 Since that video, battery-related testing has been conducted on the 2018 iPad as well as the 2017 iPad and the 10.5-inch iPad Pro, and we have some conclusions. The batteries used in the 2017 and 2018 iPads are very similar, with the older model using a 32.9 watt-hour batter that's slightly larger than the 2018 version's 32.4 watt-hour capacity. Another important reference point is the processor used in each device, which can dramatically affect battery consumption. The 2017 iPad uses the dual-core A9 processor, while the 2018 uses the quad-core A10 Fusion. Notably, the A10 Fusion uses two high-performance cores alongside two high-efficiency cores that run at lower clock speeds, with the latter able to help save battery life during times when the higher-powered cores aren't required. The iPad Pro is equipped with a six-core processor, with three consisting of high-performance cores and the other three as efficiency cores, which could save even more battery life. In benchmarks, the difference in processor shows the iPad Pro as having a massive lead in multi-core and graphics performance, followed by the 2018 iPad then the 2017 edition. Here's a chart of our benchmark tests between all three devices. As you can see, the iPad Pro has a massive lead in multi-core and graphics performance, and the 2018 iPad, on average, sits right in between the other two iPad. The first trial involved playing a 10-hour YouTube video on each iPad, to see how long each could last before turning off. The brightness of each iPad and iPad Pro was set to 80 percent before hitting play. The 2017 iPad was the first to drop out, lasting 7 hours and 40 minutes before shutting down. Six minutes later, it was joined by the 2018 iPad, achieving a similar time of 7 hours 46 minutes despite the marginally smaller battery and higher processing performance. Even though it had the smallest battery out of the three tablets, the 10.5-inch iPad Pro lasted substantially longer, tapping out after 8 hours and 7 minutes. It is likely that the efficiency cores were being used for this workload, as playing a YouTube video isn't really a power-demanding task for these devices. The second bout of testing used a more processor-intensive activity that many iPad users are familiar with: gaming. Epic Games' Fortnite was played for one hour on each iPad, to see how much of an impact it made on the battery. It was found that the gaming experience differed considerably between each model, with the more powerful iPads looking a lot better. The gaming experience on the 2017 iPad was lacking compared to the other two, with both the graphics quality and smoothness being less than ideal. After an hour of gameplay, the 100 percent battery was drained to 87 percent. The graphics quality improved during the 2018 iPad's testing, with gameplay appearing to be a lot smoother than the previous model. The 2018 iPad should be good enough to comfortably play similar graphically-intensive titles. Even with the extra processing required for the higher quality gameplay, the battery still only drained to 87 percent. As expected, the gameplay on the iPad Pro was almost impeccable, with the graphics quality being noticeably better than the other two iPads, and was incredibly smooth during matches. The appearance is extremely similar to the level of quality offered when playing the game on other formats, including desktops. Using the ProMotion display technology, games with 120Hz support will be even smoother on the 10.5-inch iPad Pro. These improvements seemed to take a toll on battery life, which drained from full down to 80 percent, which is quite a bit lower than the other two. From this, it seems that the battery consumption does increase when running more power-demanding tasks that use those high-performance cores. Finally, we used benchmark software to test the battery life. In this case, we used GeekBench 4's full drain test, which dims the screen and forces a 100-percent workload on the processor, in order to eliminate the display's usage from the result. The 2017 iPad was the first to lose power, scoring 4,840 points after running for 8 hours and 4 minutes. The 2018 iPad, on the other hand, lasted 9 hours and 10 minutes, and scored 5,500 points. These results are quite a bit different from what was observed in the other two tests, with the newer model actually showing an improvement over the 2017 iPad.. The iPad Pro achieved a massive 6,050 points after 10 hours and 5 minutes of testing. It is also the only result to live up to Apple's claimed 10 hours of battery life, even at 100 percent CPU workload. Interestingly, the battery life of the iPad Pro drained faster while running a demanding game, suggesting the GPU and better display may have more of an impact on battery life. As a bonus trial, the charging speed differences between the 2018 iPad and 10.5-inch iPad Pro were compared. The iPad Pro used the standard 12-watt charger, while the 2018 iPad was attached to a 61-watt charger with a USB-C to Lightning cable, to see if there were any differences in charging technology that would enable faster charging. Evidently, there isn't. The iPad Pro charged at an average of 8 percent every 15 minutes, compared to around 7 percent on the regular iPad. Impressively, it took about 30 minutes longer for the iPad to reach 99 percent charge. In conclusion, the iPad Pro has the best battery life out of all three iPads due to its efficient six-core processor, except for processor-intensive tasks. This is largely to be expected, considering how much performance that can be achieved from the tablet than the other two. In a few cases, the 2018 iPad does outlast the older model in battery life, but it is fairly similar overall. This is still really impressive considering the large performance improvements between the devices in benchmarks. Did you try to the 61W charger with the iPad Pro 10.5? Expecting charge times to be cut in half or so. Looks like the 2018 iPad uses the same charging circuits as the iPhone 8 & X, drawing 10 W or so. Question: Any chance that Apple will release a non-Pro 10.5” iPad in the near future? Question. Did you guys test them with ALL NEW ipads? If not then it is not a fair test. I'm pretty sure they've already done this back when the 10.5 came out. We know the iPad Pro 10.5 charges faster with a higher wattage USB-C charger, however, the question was whether Apple put that kind of tech into the 2018 standard iPad, which is why they did the charging test the way that they did. Well at this point there isn’t a single rumor about the non-Pro 10.5” iPad. So no, not a chance we would see such a product in the near future. If they even have a plan to make one at all, that is. I think this is an interesting finding. Can you please test iPad 2017 with iOS 10, instead of iOS 11 to see if there is any additional battery drain due to the OS upgrade? In this case, we used GeekBench 4's full drain test, which dims the screen and forces a 100-percent workload on the processor, in order to eliminate the display's usage from the result. That’s not a web browsing test nor a video test. That they hit 10 hours on the test is a conincidence. I’m surprised by the result actually. The GB battery drain test must only exercise one processor? 10 hrs for a 30 WHr battery means that the A10X is only consumer 3 W of power. Would have thought it could consumer 6 to 8 W. A power virus that exercises both the CPU and GPU probably hits 10 W, and will probably be throttled down to 5 to 6 W.